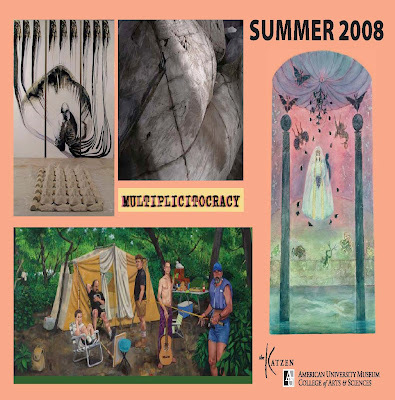 "Joe Shannon: Realism Surrealism"; "Noche Crist: A Romanian Revelation"; "Ledelle Moe: Disasters"
For the summer of 2008, Project 4 will be exhibiting a group show based on interpretations of the Sublime Landscape. Works in the exhibition explore historical issues such as Manifest Destiny as well as contemporary one's such as the increased amount of artifice and development now becoming our landscape, versus the diminishing open land that once defined it. As at one time the depiction of our landscape expressed a purity and idealism, it now addresses the mediations and anxieties present in our contemporary experience. Each artist in this exhibition takes ownership of a piece of this broad landscape, which has long served as a metaphor of the individual and society and will continue to bring forth new insights as it is constantly revisited. Sat., May 31, 2 p.m.
Ayo Ngozi's "From Nothing" is a site-specific installation inspired by El Anatsui's Gawu and the African practice of "making something out of nothing." Live sculpture-painted bodies on a platform-converse about over consumption and waste and the redemption found in artistic practice that creates new from old, beauty from trash and life where it is least expected. 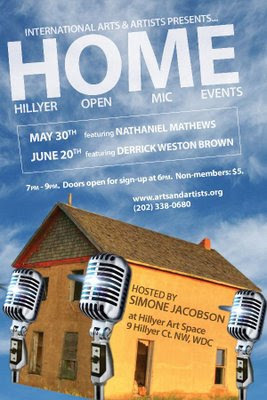 Friday, May 30th, Hillyer Art Space kicks off IA's new open mic series from 7pm to 9pm. Starting on June 20th, HOME events will always take place on third Fridays. Each month a featured poet will be joined by 6-8 other local poets who may sign up at the venue beginning at 6pm the evening of the event. This Friday will feature poet and visual artist Nathaniel Luke Mathews, whose work has been featured on the campus of Howard University and local venues across the city. Through his writing Mathews explores spiritual topics from multidimensional angles. He draws inspiration from historical figures like John Brown, Saul Alinsky, Shirley Chisolm, Jesus, and the Prophet Muhammed. His poetry is also influenced and inspired by that of Sekou Sundiata and Jalal ad-Din Muhammad Rumi. This event is free for members and $5 for non-members. Proceeds go towards supporting Hillyer Art Space's Local Artist Series and accompanying programs. * Any poet interested in signing up to perform should plan on arriving between 6-7pm. Look back at African American art of the 20th century and forward to its development in the new millennium. Dr. David C. Driskell (artist, collector, and emeritus professor at the University of Maryland) and Dr. Elizabeth Hutton Turner (vice provost for the arts and professor, University of Virginia, and former Phillips senior curator) are panelists. The moderator is Dr. Leslie King-Hammond (dean of graduate studies at the Maryland Institute College of Art). Jacob Lawrence is the starting point for a consideration of the role of African American art within the larger context of contemporary American art. In collaboration with the Millennium Arts Salon. Free; reservations are not required. Teresa Diaz, Art Curator and Collection Management Consultant will be sharing her tips and know-hows on how to attractively and intelligently present your artwork to improve your sales. While using creative presentation methods can make your artwork look interesting, dealers and art collectors are looking for a sleek, simple, and non-distracting high-quality presentation. Come find out what the tricks are and how to invest a little to sell a lot! Teresa will also be sharing tips on how to prevent your collection from deteriorating, damages from poor lighting, humidity, pests and adjecent materials, proper framing, hanging and location for your artwork. She will also share knowledge on how to document and catalog your own artwork, how to handle, ship and store it efficiently, and how to increase the value of your artwork with proper care. Girls Gotta Run (www.girlsgottarun.org) provides new shoes for girls in Ethiopia who are training to be runners. The girls who run are more likely to stay in school and improve their lives and the lives of their families. (http://www.artomatic.org/. Their space is on the 5th floor, Northwest Quadrant, No. B5. They are utilizing most of the space to present an exhibit about and information on the organization and the girls they help, rather than to showcase much of their art. However, they have a lovely pink notebook containing color printouts of all of the art in the Shoe Art Gallery, with instructions on how to purchase it. "Project 3: Empowered by Artistry." Opening Reception: June 18, 2008, 6:30 - 8:30 p.m. Girls Gotta Run Foundation, Inc.
Sarah Wilmer creates abstracted narratives in her photographs that evoke mystery and a sense of heightened reality. Her subjects are often lone figures or creatures set within a dark and wooded world engaged in actions that transcend those of the everyday. Sarah Wilmer lives and works in Brooklyn, New York. Her work has appeared in such publications as V Magazine, Vision, Nomenus Quarterly and Surface and she was named to PDN Magazines "30 under 30 to Watch" in 2007. I commend SFMOMA for honoring the brightest talents in the Bay Area with a museum show. It's forward thinking on all fronts. A Washington, DC museum would do well to emulate this progressive stance. The San Francisco Museum of Modern Art (SFMOMA) is pleased to announce the recipients of the 2008 SECA Art Award. Administered by SECA (Society for the Encouragement of Contemporary Art), an SFMOMA auxiliary, the biennial award honors local artists of exceptional promise with an exhibition at the museum, an accompanying catalogue, and a modest cash prize. 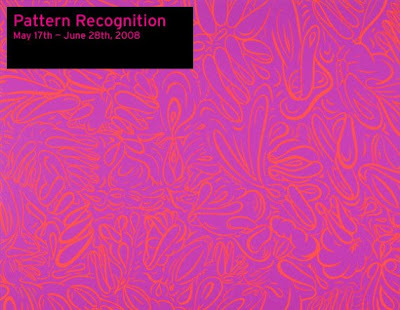 The 2008 SECA Art Award exhibition, featuring the work of Tauba Auerbach, Desirée Holman, Jordan Kantor, and Trevor Paglen, will be on view at SFMOMA from February 14 through May 17, 2009. The SECA Art Award distinguishes artists working independently at a high level of artistic maturity whose work has not yet received substantial recognition. This year, SFMOMA considered more than 200 artists working in a broad range of media who were nominated by Bay Area art professionals, including museum and alternative-space curators, art school instructors, gallery owners, critics, SECA members, and former recipients of the SECA award. After visiting the studios of 31 finalists, the winners were selected by Apsara DiQuinzio and Alison Gass, SFMOMA assistant curators of painting and sculpture. Finalists for the 2008 SECA award include: James Buckhouse, Monica Canilao, Dina Danish, Veronica De Jesus, Lucas DeGiulio, Ala Ebtekar, Dustin Fosnot, Aaron Gach, David Huffman, Prajakti Jayavant, Packard Jennings, Ruth Laskey, Christian Maychack, Keegan McHargue, Julio Cesar Morales, Jay Nelson, Kate Pocrass, Emily Prince, Lordy Rodriguez, Zachary Royer Scholz, Paul Schiek, Andrew Schoultz, Jennie Smith, Chris Sollars, Travis Somerville, Paul Wackers, and Mary Elizabeth Yarbrough. Since 1967 SECA has honored more than 50 Bay Area artists with its award program. Recent award recipients include Sarah Cain, Kota Ezawa, Amy Franceschini, Mitzi Pederson, and Leslie Shows (2006); Rosana Castrillo Díaz, Simon Evans, Shaun O’Dell, and Josephine Taylor (2004); John Bankston, Andrea Higgins, Chris Johanson, and Will Rogan (2002); Rachael Neubauer and Kathryn Van Dyke (2000); Chris Finley, Gay Outlaw, Laurie Reid, and Rigo 98 (1998); and D-L Alvarez, Anne Appleby, and Barry McGee (1996). The SECA Art Award is funded by SECA, an auxiliary of SFMOMA. The cash prize is made possible by the Robert Huston Memorial Fund. F. Lennox Campello is one of the Mid Atlantic's best know arts personalities. Educated in art at the University of Washington School of Art, Campello is a widely published freelance art critic, a curator with more than one hundred curated exhibitions under his belt, an award winning artist, a radio and TV personality often heard on NPR, the Voice of America and MHZ TV's "ArtsMedia News" discussing art issues, and one of the internet's seminal visual arts bloggers. His Daily Campello Art News (www.dcartnews.blogspot.com) is one of the web's earliest and most popular art blogs with nearly a million visitors a year. Campello is also the co-founder of the Fraser Galleries of Washington, DC and Bethesda, Maryland, which he co-owned until 2006. He currently resides near Philadelphia and is in the process of opening a new gallery space in that area. For more information about future panels, click here. In partnership with Ryerson University The Black Star Collection, which is being showcased in the United States for the first time since it was anonymously donated to Ryerson University in Toronto, Canada, three years ago, includes 330 outstanding images that American photographers captured in the latter half of the 20th century documenting world leaders, celebrities, the horrors of war, and the struggle for civil rights. Tuesday, May 27, 7 p.m.
Thomas Colville has been a distinguished private dealer in fine nineteenth-century American and European paintings, drawings, and watercolors since 1972. He has worked with individuals, corporations, and museums throughout the world to broaden their collections. While specializing in the works of such American artists as George Inness, John La Farge, James McNeill Whistler, Sanford Gifford, Eastman Johnson, and Emil Carlsen, Colville also is one of the world’s leading dealers in French Barbizon paintings. Thomas Colville Fine Art has showrooms in New Haven, Connecticut, and New York City. Some 228 extraordinary artifacts unearthed in modern Afghanistan—most on view for the first time in the United States—attest to the region's importance as a vital and ancient crossroads of trade routes known as the Silk Road, which stretched from Asia to the Mediterranean. Many of the objects were long thought to have been stolen or destroyed during some 25 years of conflict until they were dramatically recovered from a vault under the Presidential Palace in 2004. Saturday, May 24, 2 p.m.-4 p.m. Free. Saturday, May 24, 5:30 p.m.-7 p.m. Free. Saturday, May 24, 7 p.m.-9 p.m. Free. Sunday, May 25, 1 p.m.-4 p.m. $20 for materials. The SpeakEasy schedules performances of poetry, prose and music. starting at 8 p.m. with more than 14 area comedians! In the spirit of art cars and kinetic sculpture races, Artomatic is planning its own take on the classic car race with the Artomatic 500 Cardboard Creation Competition on Sunday, June 1, at 2 p.m.
Saturday, June 7, from noon ‘til 5 p.m.
art for sale - take home a special one-of-a-kind creation. Thursday, June 12, 6 p.m.-8 p.m., Artomatic 12th floor. Saturday, June 14, at Artomatic. 8 p.m. to 2 a.m., will bring together models, designers, photographers and artists. Fresh Made Italian Gelato, please....thank you! I was dreaming of a delicious Italian Gelato on our walk tonight. It's just the brisk kind of evening that calls for something sweet. Walking down P Street, I spied a sandwich board on the sidewalk in front of Crepes A-Go-Go which read, Fresh Made Italian Gelato, waterbased, dairy free. I made a beeline into the shop and ordered a small combo of raspberry and lemon gelato. Wow! Now that's a way to cap off a great spring evening. What a great find on my walking adventure. Crepes A-Go-Go opened three weeks ago with their second store at 2122 P Street NW. I'll be going back for more gelato. And while you are there, take a look around at the many new restaurants on that block. I counted four new restaurants, including Biryani Corner a small Indian place near Metro Market. They were offering a free samosa taste treat to passerbys, (I was too full to sample that one) but hey, there's always tomorrow. Even artists gotta eat. This grant will support organizations to help defray costs related to the improvement, expansion and rehabilitation of existing buildings owned or leased by nonprofit cultural institutions. The types of facilities involved may include, but are not limited to: museums, galleries, theaters, offices, arts storage/conservation, film exhibition, studios and historic buildings. For more information, please email Lionell Thomas at lionell.thomas@dc.gov or Charles Barzon at charles.barzon@dc.gov . You may also call (202) 724-5613. Please visit dcarts.dc.gov to view and download the guidelines and application form. This was a great panel with many insights into the world of art collecting. The materials are helpful for beginning and seasoned collectors alike. Here are additional resources from the panelists that they would like to share with you. Phillipa Huges of Pink Line Project introduces the panel. *Martin Irvine, Director of Irvine Contemporary shares these additional resources on how to navigate information from the artworld system. Click HERE to download his insightful handout (pdf) from the evenings talk. -Read Magazines like Art News, Auction Catalogs (i.e. Swann Catalog). -Go to Open Studios (a good way to venture into artists studios on the first visit). -Visit Museums (a good way to train the eye on art). -Topic or Interest approach to collecting (start collecting art that focuses on a topic or interest of yours). Information Overload! Art Collecting 101 Crash Course panel at Artomatic. Presented by Phillipa Hughs of Pink Line Project. My two pieces sold at the Corcoran Art Anonymous Fundraiser. You can see them, Numbers 213 and 216 online. The sale generated an important contribution of funds for the Corcoran College of Art + Design’s BFA Scholarship Fund. Go HERE to see pictures of all Art Anonymous pieces and the names of the artists who contributed them. Join artist Saul Sosnowski in a discussion of the of the AU Museum exhibition Multiplicitocracy. Artist Joe Shannon will lead a gallery talk about his current AU Museum exhibition, Joe Shannon: Realism Surrealism. Join Dr. Marek Bartelik for a discussion of the AU Museum exhibition, A Telluric Path: The Art of Nefeli Massia. Dr. Bartelik teaches modern and contemporary art at the Cooper Union for the Advancement of Art and Science in New York. He has lectured nationally and internationally at, among other places, the Boston Museum of Art, the Mondrian House in Holland, and the Pinacoteca in Sao Paulo, Brazil. 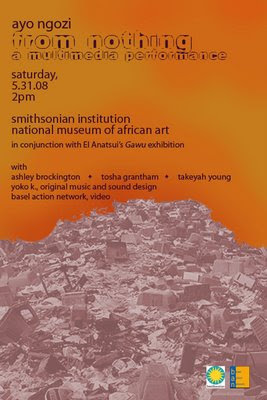 Artist Ledelle Moe will lead a gallery talk about her AU Museum exhibition, Ledelle Moe: Disasters. Join Vivienne M. Lassman, curator of the exhibition Noche Crist: A Romanian Revelation, for a walk-through and discussion. Martha Castillo, "Concerto Grosso" 34" x46"
I recently learned about the work of California artist, Martha Castillo. She works in an innovative medium called Clayprints. Invented by Mitch Lyons www.mitchlyons.com, clayprinting is a new mono type technique, with clay for "ink", and hand tools instead of a press. As Castillo states on her website, "A slab of stoneware clay is rolled flat and allowed to become leather-hard. China clay, mixed with pure pigments and water, is applied to the slab in many layers, creating the image. Using a rolling pin, and other hand tools, the image is transferred from the slab to specialized canvas. The top layer of clay is removed with each 'pull', so every print is unique." Martha Castillo currently gives workshops on clayprinting in the SF Bay Area. See workshop schedule Here. Her latest clayprints will be featured at KALEID Gallery, a storefront gallery created by a community of artists collaborating with downtown businesses in San Jose, California. Last night, collector and advocate, Philippa Hughes of the Pink Line Project hosted Information Overload! Art Collecting 101 Crash Course panel at Artomatic. It was informative and inspiring, an insightful look at beginning collecting by experts in the Washington DC area. See a list of the resources for beginning collectors on my blog sidebar, courtesy of Irvine Contemporary Director, Martin Irvine. The gist is to use resources everyday to get information about the artists that interest you and about other artists who are in the news. Look at pictures in publications like ArtForum (the Vogue of art magazines), says Mahoney. Information is essential and one must cull through the overload to find what is useful says Irvine. If you've ever thought about collecting, NOW is the time to jump in according to JW Mahoney. There is much offered in Washington, DC at the galleries, art organizations, student exhibitions and venues like Artomatic. Mahoney states that we are now experiencing a Renaissance in the arts. According to Irvine, DC is known for its diversity and excellence in artists and galleries at the national level at art fairs. The panel agreed that art in DC does not receive adequate coverage in the local papers like the Washington Post. They have one attuned journalist on staff. With the lack of press coverage, we are missing a player(s) in the field. Role, responsibility and contribution to the arts should be wake up calls for the press, not to mention the excellent content and diversity of what is happening in the arts in DC. There are many bloggers who are filling the information gap beautifully and we STILL need the print media to roll the presses on the art world in DC. The printed word and pictures still hold weight in the minds of collectors and the art world. 3-If you can't afford it, ask the dealer about something smaller in your budget. Galleries will work with you. 4-Look at prints as another option. Campello says, Don't expect artists prices to be different in the studio than in the gallery. The value of the artists work stays the same whether work is seen in a studio setting, a DC Gallery or a gallery in another city. Sharon Burton recommends visiting open studios and going to artist talks to acquaint yourself with the artists process of creating the work and to learn about their concepts. Visit galleries and art organizations to discover the art that you like. Blogs play a very big part in getting the word out about exhibitions. Burton recommends looking through auction catalogs. Mahoney suggests....Talk to other collectors for recommendations on artists and galleries. Visit artists studios to learn about and interact with the artist. According to Martin Irvine, art is about information. Good galleries inform collectors about the artists and about the general art field. The whole system is based on trust. The art gallery's main mission is (should be) to create value for its artists and collectors. Thanks to collector, Fred Ognibene for moderating this excellent panel and the panelists who gave excellent advice for new collectors. Let's have more of these Phillipa! Graham Caldwell's 2007 exhibition "Anatomies"
The competition is open to all professional artists age 18 and over who are living and working in the United States. Both emerging and midcareer artists are invited to participate. Each artist may enter one work depicting anyone—a friend, a stranger, a relative, a self-portrait—but it must be the result of the artist's direct encounter with that person. While the human form must be the focus of the work, artists are invited to interpret the concept of portraiture broadly; for example, an entry might not include a face. The work must have been completed after January 1, 2007. The winner of the competition will receive a cash award of $25,000 and will be awarded a separate commission to portray a remarkable living American for the Portrait Gallery's collection. The winning artist and the Portrait Gallery will collaborate to select the subject for the commissioned portrait. The second-prize winner will receive $7,500, and the third-prize winner will receive $5,000. Up to four additional artists may be commended for their work, and they will receive $1,000 each. All finalists' works will form a major exhibition on view at the National Portrait Gallery from October 23, 2009, until August 22, 2010. Entries will only be accepted electronically, through the National Portrait Gallery's Web site, http://www.portraitcompetition.si.edu/, from June 2 until July 31, 2008. Please read the detailed rules for the competition before entering. 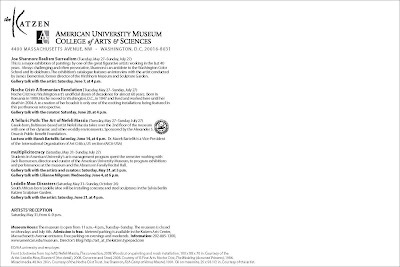 Artful Law: The Law of Art: Thursday, May 22, 6:30 p.m.-7:30 p.m. Free. How To Price Art: Thursday, May 22, 7:30 p.m.-8:30 p.m. Sponsored by the Washington Project for the Arts, free. See the Artomatic workshops page for more information. Nature in the City. Ya gotta love it. Yesterdays walk to Georgetown yielded these earthly delights. Tai Hwa Goh's layers silkscreen and intaglio prints on thin Korean paper that she then coats with beeswax. The multi-tiered process results in two- and three-dimensional creations that the artist sees as reflecting the layers of experience and search for identity. Billy Colbert "Corporate Merger" from BBBloch on Vimeo. A Commitment to Color By DANIEL KUNITZ in the New York Sun. Color as Field: American Painting, 1950–1975 is the first full-scale exhibition to examine the sources, meaning, and impact of the Color Field movement and offers an opportunity to re-evaluate this important aspect of twentieth-century painting. Washington, D.C is the only east coast city to host this landmark exhibition. "Color As Field: American Painting, 1950-1975,"curated by Karen Wilkin. Until May 26 (8th and F streets N.W., Washington, D.C., 202- 633-7970). Maura Judkis on James Marshall (Dalek) at Irvine Contemporary Here. The "James Marshall (Dalek): Overweight" exhibition is on view from 11 a.m. to 6 p.m. Tuesday through Saturday, to Saturday, June 21, at Irvine Contemporary, 1412 14th St. NW. Free. (202) 332-8767. Through a sweeping series of vivid, action-packed paintings, the artist follows an imaginary character through the history of blues music and the turbulent social conditions surrounding him. Each narrative derives from the artist’s imagination but alludes to historical events beginning in the 1880’s when Jim Crow laws were enacted throughout the South. At that time, barred from whites-only venues, African-Americans developed alternative places to perform and enjoy music – a network of clubs and juke joints called the Chittlin Circuit. Rik Freeman began his series about this famous circuit in the early 1990’s. To date he has completed twenty-five paintings ranging from intimate portraits of bluesmen to complex scenes depicting crowds of people in places as diverse as woodland clearings, juke joints, and jazz clubs. After its exhibition at GRACE the series will tour to other venues around the country, on its own Chittlin Circuit. Freeman is a well-know muralist with large-scale projects at prominent metropolitan Washington sites including the Arlington County Courthouse and the D.C. Convention Center. In The Chittlin Circuit Review, Freeman draws on his mural painting talents, inserting characters into lively settings, rich with historical references. As the first stop on the exhibition's two year tour, GRACE will also present a short film by Andrea Tree documenting a studio visit with the artist. An exhibition catalogue is available with an essay by Johanna Halford-MacLeod, Executive Director of the Franz and Virginia Bader Fund. Thursday May 22, 2008 at 7:30 p.m.
Artists Joyce McCarten and Matt Sesow. They will each offer their own unique perspective on the mystery of pricing art. Free and Open to the Public. For more information contact Adah Rose Bitterbaum, Studio Gallery, 202-232-8734. Sponsored by the Washington Project for the Arts. 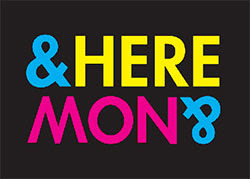 This two day festival features over 40 of the he area's finest visual artists. VisArts is proud to present this festival in coordination with the Hometown Holidays Memorial Day Weekend festivities in the new Rockville Town Square. Concrete Alchemy is a tour of 15 visual artists visiting five major urban centers on the East Coast. It is the first tour that creatively combines gallery shows, public panel discussions and numerous murals to present the artists’ unique approach to public arts. The tour visits 5 major urban centers on the East Coast over 7 days. These artists are major driving force in pushing the limits of contemporary urban arts. Their work dictates the future progression in graffiti and street art. The purpose of the tour is not only to promote the exemplary artists, but also to maintain discussion with public regarding public spaces and art in the public spaces. This artist collective was formed around ideas promoting participatory public art. By incorporating contemporary arts, the projects are increasingly popular among young population which is the main focus of the work. All artwork featured on this tour will be created by collaborative approach. On Wednesday, May 21st, 2008 they will stop at the Benning Park Community Center located on 53rd SE and Fitch St. SE, Washington, DC. They partner with Words, Beats and Life, a local non-profit cultural and educational organization that empowers the local youth with skills necessary for following their dreams. They will present their work by live painting of a large mural on the side of the Community Center and speak to the audience about their path to becoming successful artists. They will be available to meet between noon and 8pm. The size of the mural is 24’H x 65’W. Art Whino Gallery focuses on showcasing art by young and experimental artists. The art of Concrete Alchemy will be presented through slideshow of photographs of Ricardo Barros and public panel discussion. The event will start at 6 pm. The address of the location is 173 Waterfront St., National Harbor, MD 20745. After 9 pm, the artists will be presenting their work at after-party (location tba) . This live demonstration of the artistic process will include customizing of hats and sneakers. The party is organized in collaboration with SolSource. 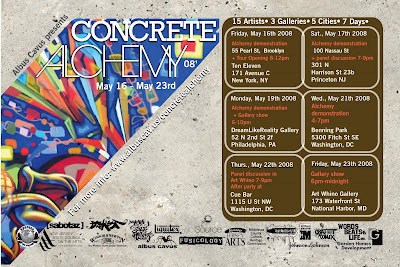 The tour will officially end with a gallery exhibit opening at Art Whino on Friday, May 23, 2008 from 6pm to midnight. The audience will have chance to view artists’ recently finished canvases and a slideshow of photographs from the previous days of the tour. These artists, who are major driving force in the contemporary urban arts, were carefully selected. Their work dictates the direction of future developments in mural art, graffiti and street art. It is not only for their technical perfection of painting with aerosol but also for their unique artistic approach to murals and public art. *Though Concrete Alchemy promotes the visual artists, music is an essential part of the culture. DJ Nex Millen of Respect the Culture will accompany the visual artists in every gallery show and at all walls on this tour. Respect the Culture is an entertainmet and multimedia company, globalizing hip hop culture through music, fashion and art. Their goal, that is making it part of the Concrete Alchemy is to return to the roots of the contemporary urban culture by focusing on positivity, creativity and non-violent means of expression. 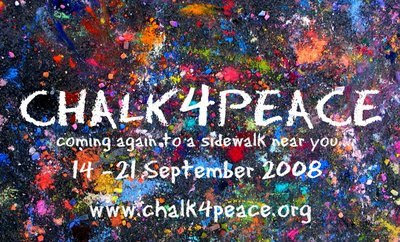 CHALK4PEACE can be found at the Visual Arts Resource Center (VARC) on the Sixth Floor of ARTOMATIC in Washington, DC. ARTOMATIC is the Beltway Arts Extravaganza that showcases hundreds of artists and artistic talents in a multitude of disciplines. May 21, 2008 Update Thank goodness!!! Twenty fish survived. I was fortunate to see the Here and Now exhibition on Sunday with several of the artists discussing their work with Kristen Hileman. See my earlier post here. And Now, Here and Now at 1840 14th Street, NW has been closed. Flickr pictures HERE. 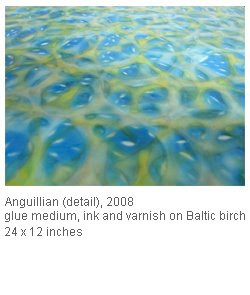 The exhibition of work by Jennifer Burkley Vasher remains on view at Transformer through May 24, 2008. Mariah Johnson and Valerie Molnar to continue the Here and Now exhibition at Transformer May 31 - June 14, 2008. To our great disappointment, Transformer's Here Now exhibition at the 1840 14th Street, NW space has been closed. Due to issues beyond Transformer's control, the building site has been closed to the public by the city. See DCist.com for the backstory: City Shutters Art Space, Locks Up Goldfish Inside. We are grateful to all of them for sharing their incredible talents, time, and energy with Transformer and the DC community. We had one very successful week of the exhibition that included close to 300 visitors, an opening day performance by Paul Shoemaker, a talk and tour through the exhibition with Kristen Hileman, Associate Curator of the Hirshhorn Museum Sculpture Garden, and the DC based artists in the exhibition (Jiny Ung, Mandy Burrow, Graham Childs Lily deSaussure, Kyan Bishop Kate Hardy), as well as part one of a guest lecture with visiting artist Matt Mullican. Our thanks to Matt, as well as Nora Halpern and Welmoed Lanstraa of Street Scenes DC, for making Matt's lecture possible. As a result of the premature closing of this dynamic exhibition of work, Transformer will be hosting a party at Comet Ping Pong on Saturday, May 31 at 9:30 pm to share images of the artists' installations, and programming that took place at 1840 14th Street, NW during the week that Here Now was on view. Please come join us to celebrate these artists and their work. Transformer Board Member Iona Rozeal Brown will be dj-ing along with special guests. 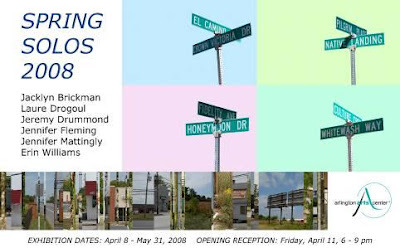 The party at Comet Ping Pong will follow the opening of site-specific work by Mariah Johnson (Los Angeles, CA) and Valerie Molnar (Richmond, VA) at Transformer Saturday May 31, 2008, 1-7pm. As part of the opening day, the artists will discuss their work at 3:30pm in conversation with Cynthia Connolly, Director of the Ellipse Art Center and Curator of The Thread as the Line. EXHIBITION HOURS for Here and Now at Transformer: Wednesday - Saturday, 1-7pm by appointment. For images of Here and Now, as well as information about the participating artists, please visit Transformer's website or download the press release. Jackson Art Center is hosting a talk by noted DC art collector and arts activist Philip Barlow on Tuesday, May 20 at 6:30 pm. It should be a lively discussion. Jackson is located at 3048 1/2 R street, NW, across from Montrose Park in Georgetown. Doors open at 6:15, program at 6:30, refreshments will be served. Thursday May 22, 2008 at 6:30-7:30 p.m.
Panelists Nancy Prager, Esq, Professor Christine Farley and Janet Fries, Esq. will address practical legal issues related to being artists. More information about this workshop will be posted on the Event Calendar at www.artomatic.org. Thursday May 22, 2008 at 7:30 -8:30 p.m.
Come hear from a distinguished panel of gallery owners, directors, collectors and artists on how to price art. The panel includes Arthur Mason, lawyer and art collector with his wife Jane Mason, Zenith Gallery owner, Margery Goldberg, Gallery Directors Amy Cavanaugh and Briony Evans from Honfleur Gallery, and artists Joyce McCarten and Matt Sesow. They will each offer their own unique perspective on the mystery of pricing art. James Marshall (Dalek), Untitled 2008.3, 2008. Acrylic on panel. 30 X 30 in. Irvine Contemporary opened an exhibition by James Marshall (Dalek): Overweight which runs to June 21. The reception yesterday spilled out into the street. Five wonderful paintings are displayed. The show is excellent, elegantly exhibited, sold out and worth repeat visits. Along my walking path to several mid city artists open studios yesterday, photos HERE, I happened across Cafe Collage at 1346 T Street NW. The owner made me a cup of the most delicious chai. The cafe features the contemporary artwork of Ethiopian artist, Yeshewawork Asseta through the month of June. The cafe has recently reopened and is a wonderful new stopping place in the neighborhood for food and coffee. Give it a try. You'll love the art and the friendly atmosphere. Check out pictures from the discussion of work between selected Here & Now artists and Kristen Hileman, Assistant Curator, Hirshhorn Museum & Sculpture Garden. Kristen lead an abbreviated tour of the exhibition in conversation with artists Jiny Ung (Washington, DC), Mandy Burrow (Arlington, VA), Graham Childs & Lily deSaussure (Washington,DC), and Kyan Bishop & Kate Hardy (Washington, DC). I took a sneak peak in the window of Addison Ripley tonight of the current exhibition. I was fascinated with the surfaces of the Kevin Kepple paintings that I saw. I'll definitely return to see them during gallery hours. Kevin Kepple utilizes a unique combination of assorted glues, handmixed inks, and varnishes to create his richly textured, luminescent abstract paintings. While these works may at first appear to be comprised of random and haphazard patterns, the fluidity and immediacy reveals itself to be thoughtfully applied and deliberately weaved. Amazingly, the movement, energy, and emotion conveyed by Kepple's work is in direct contrast to his chosen medium. Kepple is a Washington, DC, based artist who grew up in rural southwestern Pennsylvania. a tiny park, book hill, across from addison ripley gallery on wisconsin ave.
What's this say about art and the economy? 1:30 PM - Discussion of work between selected Here Now artists and Kristen Hileman, Assistant Curator, Hirshhorn Museum. Kristen will be leading an abbreviated tour of the exhibition in conversation with artists Jiny Ung, Mandy Burrow, Graham Childs Lily deSaussure, and Kyan Bishop, Kate Hardy. 3 PM - Guest lecture by current Whitney Biennial artist Matt Mullican (New York, NY), presented in partnership with Street Scenes: Projects for DC. Matt will be speaking about his work, sharing images of past and current projects. This year’s Artomatic has more to see than ever before. Ten floors of work, including ceramics, sculptures, installations, paintings, fiber works, murals and photography are on display, and in many cases, the work is for sale. Visitors on Meet the Artists Night will be able to sample the fun, creative energy that is Artomatic. A full schedule of free events is planned for Friday, including films, dance, poetry, music and even fire dancing. Live music will kick off at 6 p.m. and run through 1 a.m., with performances by James Stephen Terrell, Movimiento, Collider, DJ Sequoia and others. Artomatic artists will be on hand to answer questions about their work. Beverages will be sold at Artomatic’s first and 11th floor bars. Swap ideas with Artomatic artists, including Erin Antognoli, Michael Auger, Jennifer Beinhacker, Angela Raincatcher, Kerri Sheehan and Jack Whitsitt. If you blog, you’re invited. Pizza (aka blogger fuel) will be provided courtesy of Uno Chicago Grill at Union Station. Free wireless will be available, so you can send your thoughts straight into the blogosphere live from Artomatic. Blogger’s Night is hosted by photographer (and blogger) Angela Kleis, an Artomatic participant. The DC Commission on the Arts and Humanities (DCCAH), in collaboration with District Department of Transportation (DDOT) and surrounding communities, is seeking an artist or artist team to work with urban designers, transportation and trail planners, landscape architects, civil engineers and District government employees to create a comprehensive and cohesive plan that visually unifies the Metropolitan Branch Trail (MBT) with artistic enhancements. This artistic driven identity created by the selected artist(s) will be included in a variety of signage and amenities along the trail as well as maps and materials about the trail. This call is open to Mid-Atlantic artists. For more information please email Deirdre Ehlen at Deirdre.Ehlen@dc.gov or call 202-724-5613. The Northern Virginia Fine Arts Festival is an annual juried street festival held in the heart of Reston Town Center. You can experience and purchase art directly from talented artists. The Barracks Row Main Street in Washington, DC seeks an artist or artist team to design, create and install an urban mural for the SE Freeway overpass that divides the south end of 8th Street SE, now known as Barracks Row. The goal of this project is to create a unique landmark that expresses the character of the surrounding neighborhood. The large mural will help draw residents and non-residents for repeated viewings to the area and reinforce a sense of place within this community. The theme for the art should be reflective of the history of Barracks Row as it connects with the Anacostia River, the Navy Yard, and/or the District’s first commercial corridor along 8th Street. Graphic representations must include a transportation theme but may also incorporate nature scenes, waterfront scenes, commerce scenes, architectural scenes, and/or statuary. Barracks Row is interested in a pictorial representation that will bridge the north-south ends of the street with interesting subject matter in the trompe l’oeil style. Irvine Contemporary is pleased to present James Marshall (Dalek) in his only 2008 solo exhibition, Overweight. After many years of thinking about American culture, high and low, James Marshall has developed what he considers his most ambitious series of new works. His new body of work revels in a profusion and hyper-abundance of color and planes of space: the familiar lines and iconic “Space Monkey” references that defined his earlier work are only a starting point for a new series of meditations on the push and pull of forces he sees in contemporary life. Working largely intuitively and organically, he allows each painting to become a new discovery, and the ongoing series of discoveries that defined his career have now led him far beyond his beginnings when, right out of art school, he found a new way to merge street art, cartoons, Japanese pop, and the energy of the urban punk scene. A major turning point in Marshall’s studio practice was working as Takashi Murakami’s assistant in 2001. He now goes far beyond Murakami’s “superflat” to a kaleidoscopic play of space and color that embodies the competing and conflicting forces in today’s world. A Great Artist, a pioneer in pop art whose talents included painting, sculpture and dance, has moved on. Rauschenberg died Monday. He was 82. Click title to read the NY Times Article. For 4 days and 3 nights “International Art Affairs” will feature work by fine artists from Austria, Australia, Argentina, Belarus, Brazil, Chile, China, Ethiopia, France, India, Iraq, Italy, Mexico, Norway, Russia, Serbia, Slovakia, Spain, USA, and other nations in an exhibition of fine art in a variety of media. This survey of international art celebrates the unique position that Washington enjoys in a very intertwined world. International art affairs involve artists, agents, collectors, dealers, embassies, cultural attaches, galleries, artist representatives, social and art clubs, art and artist promoters, and other participants. The link between the arts and culture of Washington’s international community and DC’s own art scene is at the core of this international art affair. “International Art Affairs” is a member of Cultural Tourism DC and a participant in the Passport DC program. The four-day art extravaganza beginning on May 15th and ending on May 18th features browsing, seminars on the subjects of collecting Indian contemporary art and about appreciating art, and social afternoons and evenings. Saturday May 17th features “art seminars” and an evening of “browsing and music” featuring views of the Skate Lab from “The Rat Hole” at 1052 9th Street. 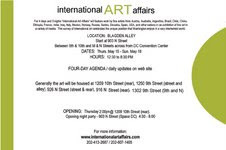 The “Blagden Alley” neighborhood, adjacent to the DC Convention Center on 9th Street is the main site of “International Art Affairs”. 35,000 plus square feet of exhibition space in some of the nooks and crannies are being utilized in the art fair – including the building that was home to “Signal 66” one of the most eclectic DC artist studios and concert halls of its time. “Blagden Alley” is bordered by 9th and 10th streets on the east and west and M and N streets on the north and south. “International Art Affairs” shows that in Washington, D.C., international art is synonymous with its art scene. The art featured in the fair represents creative impulses from many places including Washington. Works on exhibit include fine arts, digital, and new media, performance art and site-specific works. Featured artists will include: Billy Colbert, Cecilia Biagini, Chris Tousimis, Eames Demetrios, Fernando Canovas, Fernando Molero, Francie Hester, Gonzalo Lebrija, Ivica Volanska, Joan Belmar, Josefina Canal, Laurent Ziegler, Lourenco Goncalves, Maria Elena Naveillan, Marina Podesta, Najwa Jasim, Pooja Coondoo, Raimundo Rubio, Ren Hui, Ren Rong, Wu De Wu, Xevi Vilaro, Yang Tao, and more. Art Talk: International Art Affairs – How they happen? 2D and 3D art in Blagden Alley. Evening Social “Looking Through the Rat Hole to the Skate Lab” 1052 9th Street (street) or in Alley (rear). Drawing from Within: The PATA Blog: $$$$$!!! Gretchen Feldman: "stitches in time, etc."